WASHINGTON (AP) — Melania Trump is listening and learning about the nation’s opioid epidemic. 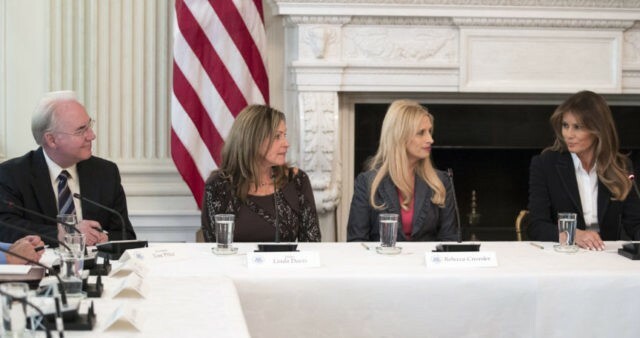 The first lady heard Thursday from experts and people affected by addiction to drugs whom she invited to the White House for a discussion. Mrs. Trump said she is concerned about the well-being of children and wants to help as many as possible with the issues they face growing up. “I am here today to listen and learn from all of your stories, and hope you will feel free to give me your thoughts and opinions on how best I can help,” the first lady said as she opened the meeting. Mrs. Trump was joined by Kellyanne Conway, a senior adviser to President Donald Trump; Health and Human Services Secretary Tom Price and New Jersey Gov. Chris Christie, who chairs a presidential commission on drug abuse and opioids. Other participants included a recovered addict and a husband and wife whose son recently died of a drug overdose. The first lady has shown particular interest in the opioid issue. She joined the president for a briefing on the crisis last month. She also met regularly during the presidential campaign with families who had been affected by drug abuse and addiction, said her spokeswoman, Stephanie Grisham. Grisham said Mrs. Trump wants to work with the presidential panel on youth and prevention initiatives. President Trump said last month that he will officially declare the opioid crisis a “national emergency,” but he has yet to issue a formal declaration. The commission chaired by Christie has called on Trump to take such a step. Christie led a meeting of the commission Wednesday in an office building on the White House grounds. The first lady was in New York and did not attend. The panel expects to issue its final report by Nov. 1, a month later than originally scheduled.